Already have a Gift Voucher or Gift Card? Lucky you!Enter your Gift Voucher or Gift Card in the box below. Q: How long are vouchers valid for? The face value of any Adrenaline Gift Voucher can be used towards any Adrenaline experience for up to three (3) years. In the event that the price of the activity displayed on the gift voucher increases after a period of 12 months, customers may opt to pay the difference between the face value of the gift voucher at the time of sale and the price at the time of redemption, or use their gift voucher credit towards any other booking on the Adrenaline site. Q: Can I use my voucher for another experience? Absolutely, Adrenaline vouchers are fully flexible. To redeem your voucher for another experience you just need to click "Book Now" on your chosen experience, then enter your voucher number at the checkout. If it costs more than your voucher credit, you can top up using a credit card or PayPal. Q: Why is my voucher not working online? You may need to check that you are entering the full voucher number, including the hyphens. Q: How do I redeem multiple vouchers? Enter your first voucher number in the "Use Your Voucher" section of the website. Then proceed with your booking (adding more participants if required). Finally, at checkout, enter in your other voucher numbers to complete your order. Q: Can I have a refund on my voucher? Adrenaline vouchers are non-refundable, however they are fully flexible. This means you can redeem your voucher towards another experience offered on the Adrenaline website or alternatively transfer the voucher to someone else. Q: How do I change the name on my voucher? To change the name on the voucher you will just need to complete a transfer of voucher form. Q: My voucher has already been paid for, why is it asking me to pay again? You do not have to pay anything further when redeeming your voucher, the booking price showing will be covered by your voucher. Q: I redeemed my voucher but I do not know where to go. All the important details (where to go, what to bring, etc.) will be emailed to you shortly. Q: How do I redeem my voucher and add more people? Enter your first voucher number in the "Use Your Voucher" section of the website. You can then add extra participants in the booking page. You can pay for extra participants using a credit card or PayPal at checkout. Q: I redeemed a voucher and bought a second ticket but it charged me the full amount. The amount shown is the total for the whole booking; it does not provide a breakdown of payments. When the booking is confirmed, the voucher is redeemed in full and it is only the difference that is charged to the card. Q: My Voucher is about to expire - what next? Need more time? You can extend the credit on your voucher for a fee of $30. Simply enter your Voucher number in the box above and follow the prompts. Did you know you can attend an experience AFTER the expiry date? Simply make a booking before your voucher expires and you can attend after the expiry date. 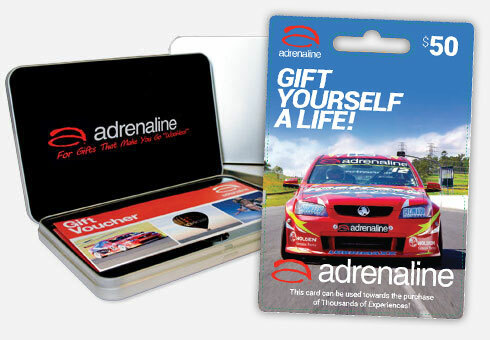 If you've been lucky enough to receive an Adrenaline gift voucher then you'll want to know how to use it. The information on the page covers the most frequently asked questions, to make it as easy as possible to redeem your voucher. You'll find the answer to questions relating to gift voucher validity, refunds, using multiple vouchers, what to do if your voucher is about to expire and changing the name through voucher transfer. If for any reason you can't find the answer you're looking for, are experiencing any issues or simply want to ask a question relating to your voucher or a particular experience, contact us directly and one of the Adrenaline team will help. If you're looking to buy gift vouchers and would like further information about how to do it and the options to available to you, head over to the Adrenaline gift vouchers page.